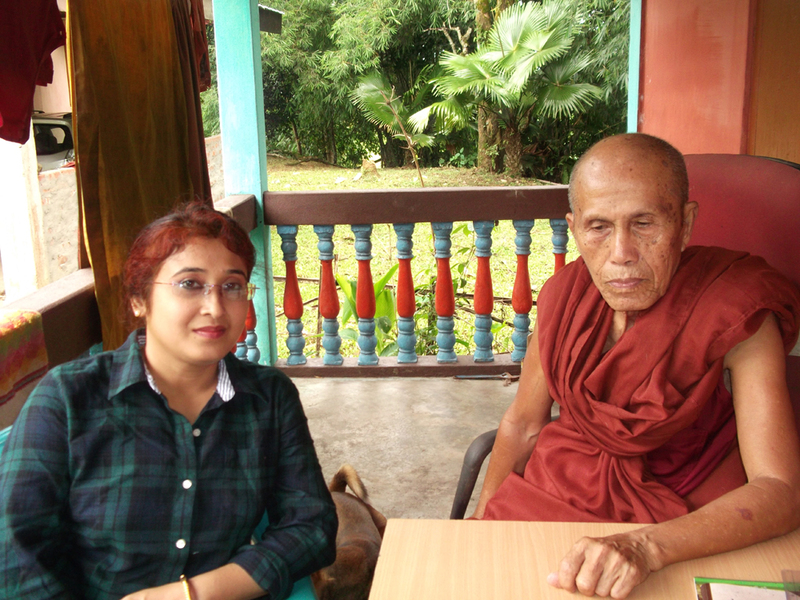 Dibong Bhante with the writer. Venerable Warnasara Mahathera, popularly known as Dibong Bhante, of Dibong Buddha Vihar, Margherita left his mortal body today in his vihar at 6.30 am. He was 82. This unpretentious and polite monk has been seriously sick for last two months. He was admitted to Aditya Diagnostics and Hospital in Dibrugarh where he was diagnosed with severe gastric. After some days, when his health condition did not show any improvement, he was shifted to Rontix Hospital of Margherita. But his condition deteriorated further. He was finally taken back to his vihar where he breathed last amidst a host of monks and grief-stricken devotees. A man of few words Bhante Warnasara was a great Pali Scholar of Assam. He ran a school in Pali near his vihar. Before meeting him, I had a wrong notion about Pali that it has a distinct script. It is from him that I got to learn Pali can be written in all scripts. Thus in Assam, they use Assamese scripts. But his knowledge in Pali in particular and Buddhism, in general, cost him lots of his patience, perseverance, and willpower. It was indeed a challenging job for an Assamese who cannot speak or understand any language other than Assamese to go outside Assam for study, let alone going abroad. Bhante made it. He went to Sri Lanka to have a deep understanding of Theravada Buddhism. Later he enlarged the horizon of his understanding through his study at Nalanda and Magadh University. Bhante Warnasara Mahathera always wore a serene look. He looked to me quite unperturbed by anything around. In my two hours conversation with him, I did not find any change in his tune (which was so even, never loud and never low). It left me in wonder if he has any emotion. His calm nature reminded me of the verse of the Gita “Dukhesu anudvignamanah// sukhesu vigata-sprhah// vita-raga-bhaya-krodhah// sthita-dhir munir ucyate” (One who is not disturbed in spite of the threefold miseries, who is not elated when there is happiness, and who is free from attachment, fear, and anger, is called a sage of steady mind). He strictly followed the Buddhist teaching ‘before you speak, let your words pass through three gates: Is it true? Is it necessary? Is it kind?’ He did not speak anything that he was not sure of. But unfortunately, on the day of his demise, the electronic media are showing the videos of another monk (who is still alive) against his name. This left many devotees in confusion who has not died in fact. Let Bhante’s soul rest in eternal peace and let his vacated place be filled by some learned monk to keep enlightening the Assamese folk with the Buddhist teachings. Ramala Sarma is an Assistant Professor at Nowgong College, Nagaon. She can be reached atramalasarma@gmail.com.